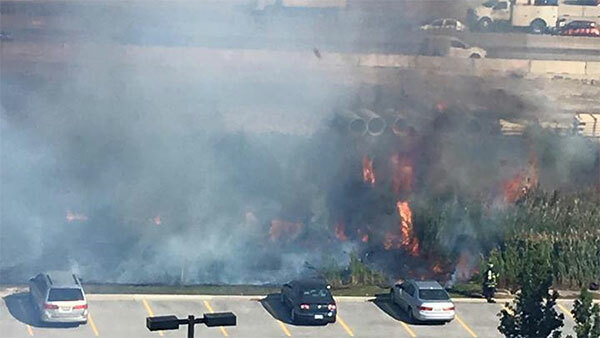 A brush fire in Schaumburg, Ill., at I-90 near Route 53 on Oct. 19, 2015. SCHAUMBURG, Ill. (WLS) -- High winds and dry fields fueled several brush fires in Illinois, one in Schaumburg and another in Will County. Dry brush across the street from I-90 near Route 53 in Schaumburg ignited around 3:30 p.m. but the fire was struck quickly. Firefighters also battled a brush fire in Will County Monday, between Wilmington and Manhattan, Ill. No injuries were reported and while firefighters are still fighting the fire it has been brought under control. The National Weather Service issued a red flag warning Monday, meaning that critical fire weather conditions - a combination of strong winds, low humidity, dry ground and vegetation and warm temperatures - are occurring. That means brush fires will start easily, spread rapidly and be difficult to control. Winds gusted 20 to 30 mph Monday, though they are expected to diminish at sunset. The red flag warning is in place until 7 p.m.